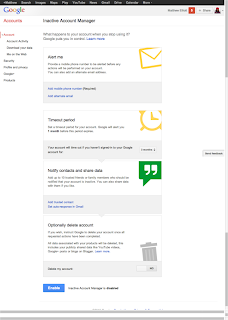 Recently google had launched the Google Inactive Account Manager that will provide the facility for google users to opt how they want their accounts to be handled after they die. Not many of us think what will happen to our important data(in gmail,YouTube,Google Drive,Picasa photos and other), we have stored with the google accounts.Because that is probably not something we really want to think about, But making plans for what happens after the any problem is really important for the people we leave behind. Goggle Inactive Account Manager provide the facility to configure whether the user want to share the data with family or friends or want to delete after they gone. 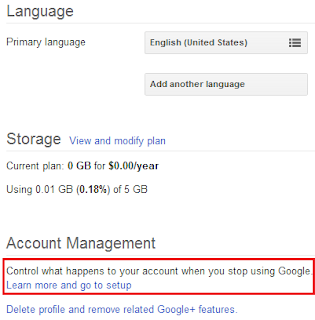 Firstly, User can you set up a timeout period either of three,six,nine or twelve months of inactivity.After that, user can have option to delete all of the data or can select up to 10 trusted contacts who can receive the data from the google services. Google will alert users via text or email one month before any data is deleted or handed over to the friends or family members. 1. Login to gmail with your credentials. 2. Go to "Account" ssection. 3. Now click on the link selected in displayed image. 4. Next page will come now click on "Setup" button. 5. Now, below page will be displayed.Configure all the details. Alert section- Mobile Number/Email to which google will send a warning text message one month before account is seems inactive. Timeout period section - Need to set the period of inactivity after this google thinks that any problem happened with the user.It be set to 3, 6, 9, or 12 months. 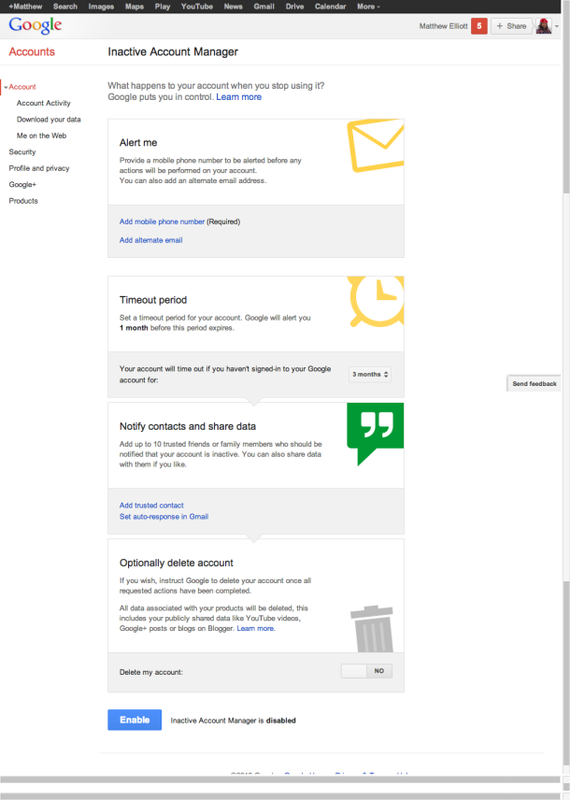 Notify contacts and share data section - For each contact, user need to provide email and phone number that google will use to send a verification code to the contact who need to access data.In this section, user can also set an auto-response for all incoming e-mails to your gmail address once it becomes inactive. 6. After all the setup, Please click on "Enable" button. 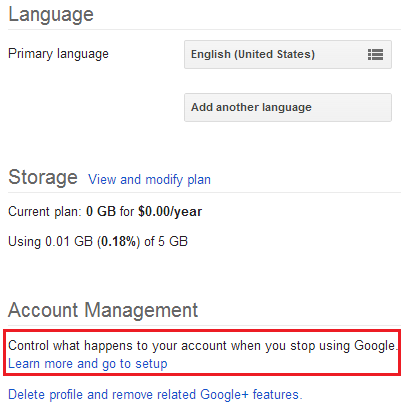 Now Inactive Account Manager setting is done on your google account.